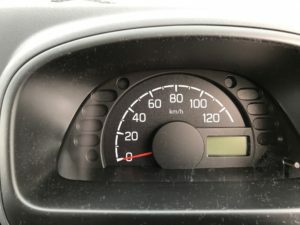 What to Look for When Buying a Used Mini-Truck or Used Car | RSM & Associates Co.
First, lets look at the odometer and what it says and does not say. If the vehicle displays in kilometers you can convert them to miles by multiplying by .62. So if the vehicle you are looking at has 55,000 kilometers, you know that is 34,100 miles. In Japan, the average miles driven is only about 6,000 a year. This is about half of what the averages are in the US. If the vehicle has higher than average miles, it should show higher than average wear and tear and conversely if it has a low odometer reading, it should be in better than average condition. If it is worse than average, it probably received an uncharacteristic low level of care, or you may not be able to rely on the odometer representation. Appraising anything is always subjective. Some buyers think a scratch or dent is critical, others think the miles are the most important. Actually, an appraisal comprises the whole vehicle; miles, paint, overall condition, it all adds up. Does it start easy and run well? Will it clean up? Will some of the scratches buff out? An experience car dealer or buyer will look at a car and know how the car will spiff up just by looking it over. This type of experience comes from years of looking at vehicles and seeing what happens to them in the cleaning process, buying and selling, making mistakes and remembering them. Now, if you haven’t looked at thousands of cars in your lifetime how are you going to look at one truck sitting by itself and make an informed decision? If you do not know what it should look like you will not be able to tell it doesn’t look like it should. Well, let’s go back to the odometer. Let’s say your truck has average miles on the odometer. Let’s look at the interior. 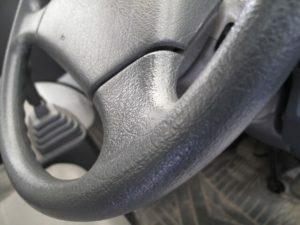 Is the steering wheel trim worn smooth? The steering wheel has fine etchings that are gradually worn smooth as the vehicle is used. 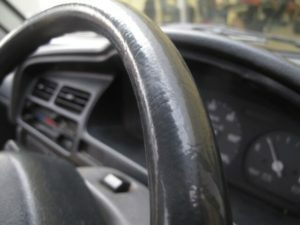 If enough wear is present, the steering wheel edges become smooth and shiny like glass. It takes tens of thousands of miles to wear the steering wheel smooth. If the odometer says 12,000 kilometers and the trim is smooth, it most likely has higher kilometers than what is represented by the display. You can also look at the shift lever for the same type wear. People will often times use a steering wheel cover, but rarely is the shifter covered. The wear should be comparable to the rubber pedals, the door sill paint and the armrests. Look to see if the upholstery is cracked or torn and if the brake and clutch pedals are new or worn to the metal? Is the door sill paint worn where people drag their feet to get in? How much bare metal is showing in the sill area? Is there any fresh paint or new undercoating? You have to look at all the wear factors to get a full picture of how much faith to put in the odometer display. 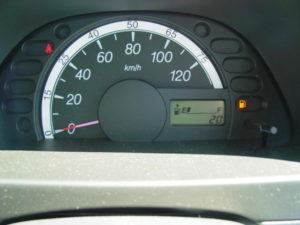 Most odometers are accurate representations of the wear experienced by the vehicle, but it never hurts to be skeptical. If you know what to look for you can be a better buyer . Each worn part becomes a clue to solve in the history of the vehicle you are looking at. You should take careful notes and remark in your notes whenever the vehicle seems out of line with your expectations. Excessive wear or lack of wear should be equally jarring in your notes. If you see a new rubber clutch pedal cover. Why is that? They usually last the lifetime of the vehicle. Do you see what I mean? A new clutch cover may just mean the old o ne didn’t last as long as expected. 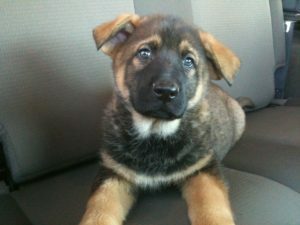 Maybe a puppy chewed it while waiting for his master. We all know things do break and need replacing, but if the pedal was changed, the fabric is new on the seats and the door sill has fresh paint, it could be a sign indicating the wear is higher than average. Use a good sense of caution as you investigate your purchase. If you see a truck that has wear levels that seem out of balance with the odometer disclosure, this is the time to dig down or walk away. I have asked all of my children this question, “What is the difference between wealthy people and themselves?” All of my children gave about the same response, indicating that wealthy people have lots of money and they do not. Nope, not even close. I followed up with this question, “What is the one thing that wealthy people have and you do not?” And I reminded them that it was not money or time. After a bit, I told them the thing that rich people have that others do not, is the ability to walk away. As soon as you lose your ability to walk away from any deal you are sunk. Rich people get the lowest prices on everything because they never lose the ability to walk away. They vote with their feet. In the retail business oftentimes salespeople work the hardest to provide the best deal to the people that need it the least because they will walk and others will not. Let’s direct our attention to the frame, under the tray and the cab. If you look at the frame and you see that it has been painted. Most likely, rubberized undercoating has been applied. This undercoating is a material (usually black) that is sprayed under the body rails to keep the vehicle from rusting. It is also used to cover previous repairs and this makes it harder to spot defects. Undercoating does make the vehicles’ underside look nicer because it becomes a uniform color. Unfortunately, you do not know what it looked like before they painted it. Sometimes this process is done to camouflage previous repairs, or hide rust. Or it could simply have been done to make the vehicle look nicer. If you see the undersides “blacked out” just take a minute to look it over. Poke a couple of spots with a screwdriver. If the screwdriver goes through, start looking for a different vehicle. You would be foolish to buy any vehicle with a rusted frame. A rusted frame is probably the only thing that cannot be fixed economically or safely. I think the outside and the inside look good. What should I look at next? The next thing to do is look at the coolant reservoir. The color should be a solid color like green, red, yellow or pink. It should not be black or mucky. There should not be any sediment in the reservoir. If you see sediment, use caution. Particles in the coolant reservoir are not a good sign. It usually means that someone has tried to fix a leaking gasket with metal particles. Sometimes the particles work for a long time and sometimes they do not work at all. Either way, you might want to move on to the next truck if you discover metal particles in the reservoir unless you are planning to learn how to repair a head gasket. If the reservoir is good and you buy this truck, don’t forget to check the coolant freeze temperature and make sure it is good for your area. The reservoir is clean. What is next? Look the motor over for fluid leaks. You should check again after the motor runs a bit. It is common for all motors that are 8-10 years and older to begin to seep oil. If it is a common slow, ebbing leak, all you will see is a brown stain on the motor. If it is a rapid or continuous leak, then the oil on the surface of the motor will be clear because it is leaking so fast it doesn’t have time to collect dirt. The seeping leak is something you should check to make sure it doesn’t get worse. The continuous leak will demand your immediate attention and repair. You may also smell burned oil if you have a gasket leak. This happens when the oil leaks from the gasket onto the exhaust and is burned off when you drive. The next thing to do is to start the truck. The truck should turn over quickly and start within a few seconds. It is impossible to describe how a proper good running vehicle should sound so I will tell you what it shouldn’t sound like. You should not hear any clicking, tapping or knocking. Any clicking noise should not go away or come back when you rev the motor. The truck motor should have a smooth whirring rhythmic sound. Any vibrations should be small, steady and uniform. If you feel the engine sputter, or stall it could be carburetor, fuel injection, fuel filter, bad plugs, timing, sensors, contaminated fuel or any other number of problems. If the truck just turns over and over without starting and you smell gas, use caution so that you do not wash the pistons with the gas that is being pumped into the cylinder. If you keep turning the vehicle over the gas will begin to condense in the cylinders. From there it will drip down and remove the oil lubrication barrier that allows the pistons to move up and down. This will lead to damaged rings and a loss of compression. Do not turn the starter continuously for more than 10-15 seconds. If the vehicle does not start, there is something wrong and you will ruin the motor if you continue to turn it over. If you ruin the motor you probably won’t get to the test drive. Many of the trucks start out at a high rev and slow down as they warm up. This is expected. The truck started. What should I look for next? There should not be any visible exhaust smoke coming from the tail-pipe or anywhere else. You should not smell gas or oil. If you see black sooty smoke, then the truck is running “rich” or the fuel supply systems are putting too much fuel in the cylinders and it is not getting completely burned. It could be a number of things that could cause a motor to run rich. It is hard to tell if there are other problems because one issue can block you from seeing other problems. If you see blue smoke it usually indicates that you are burning oil. The oil for lubrication is getting past the rings and into the combustion chamber with the gas. Neither color smoke is a good sign and usually means substantial repairs are in the near future. If you see a white smoke it means that water is getting into the combustion chamber by a breach in the head gasket. 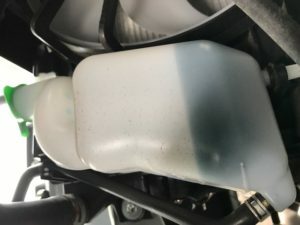 If you catch the leak early enough the fix is not too bad, but engine coolant is very corrosive and can cause substantial damages if allowed to continue. Head gasket failure can also be noticed by a loss in coolant without the smoke when it leaks out the side of the motor as you drive down the road . If you are adding more than a few ounces of coolant a year you have a leak. 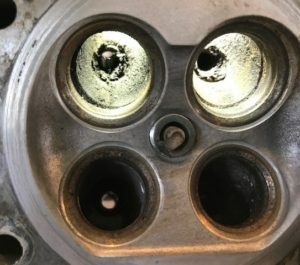 The motor does not smoke, rattle, belch, or smell like burned oil. What should I do next? 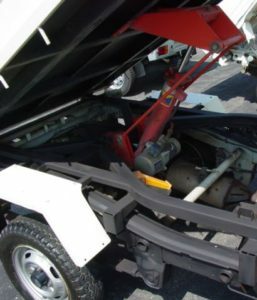 Look at the motor and under the motor area to see if there is a fluid leak while stationary. Rev the motor gently and then harder. The engine should rev smoothly and drop back to idle speed after it has warm ed to temperature. Press the brake. It should feel firm. Press hard. The pedal should stop before reaching the floor. If it is a manual transmission put the gearshift in neutral and push the clutch in and out. 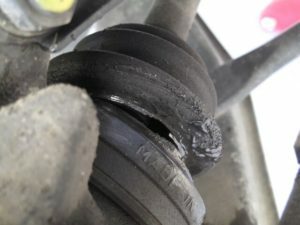 If you hear bearing noise when the clutch pedal is released then most likely you have a worn throw-out bearing. If the bearing noise does not stop then it’s about time for a new clutch, pressure plate and throw-out bearing. Some people only replace the clutch and pressure plate when repairing the vehicle. Proper repair and good common sense will tell you to replace the bearing too. The bearing cost is nominal compared to the labor involved in getting to the bearing and replacing it. Put the truck in gear and slowly let the clutch out. The clutch should engage the gears when the pedal is let out about half way, although there is some adjustment available. Put the truck into first and reverse gear while pressing the clutch to get the feel if the gears are properly synchronizing. Shifting should be smooth and without much effort to move between the gears when the clutch is depressed. The shift linkage allows the gears to mesh. What next? Check out the front end, first by driving in a circle in rear wheel drive, then doing the same in four-wheel-drive. Start out by driving slowly in a tight circle. Go in a tight circle turning right then a tight circle turning left. Listen for clicking or clunking noise when you are turning. If you hear noise it is probably the constant velocity (CV) shafts that turn the front wheels that are bad. If you do not hear any clicking or clunking try it in four-wheel-drive. If you drive in a tight circle you should hear the tires squeak and hop just a bit as you turn. This means the four wheel drive is working. Take it out of four wheel drive and proceed on smooth pavement, then later on rough pavement. If you hear clicking or clunking from the front axle area, it is possible your constant velocity (CV) shafts are going bad or are bad. You will only be able to tell if the CV shaft is bad when turning. Going straight it will only make a noise right before it is going to fail. Another good idea is to look over the rubber boot at the head of the CV shaft. Many times people damage these boots by running over things. Once the boot is torn the grease leaks out and the bearing seizes up because it is no longer lubricated. The steering should be reasonably tight which means there should not be much play in the steering. The front wheels should move at the same time you move the steering wheel and you shouldn’t be able to move the steering wheel and not have the front wheels move too. 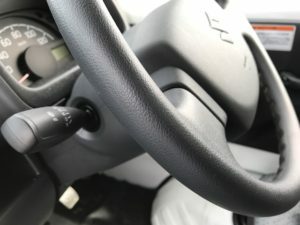 If you can move the steering-wheel without changing the direction of the vehicle, then the steering guidance parts are worn and the front end should be serviced. The item providing much of the play when it is worn is called the ball joint. It could also be out of alignment. A bad alignment will also give you more play (movement) in the steering than normal. If the alignment cannot be improved by adjustment, the tie rod ends may be worn and in need of replacing. Front end parts usually take tens of thousands of miles before they are noticeably worn, so if you notice steering issues on a low mileage vehicle, you may not be able to rely on the odometers representation. If your truck has passed all of your checks so far, now would be a good idea to check the oil. The oil should be a caramel color. If it is black, then it has not been changed in a long time. If the oil is up to the proper level and it is black in color, then it may be that it just hasn’t been changed. If it is down a quart and black, score that a negative mark for your appraisal. 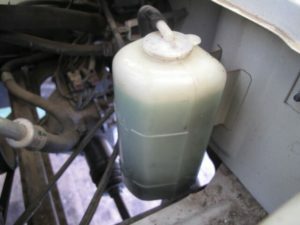 It would be a good idea to check the brake fluid reservoir to see if it is low. If it is low, ask if the brakes have been done recently or ever. Also remember to ask if the vehicle has been freshly serviced. Somebody has to do the service on it. Better them than you! There are other things to look at in your search but the items I mentioned will help you become a better buyer. If you check over the main items we have mentioned, most likely you will have good luck with your used vehicle.